Personal information is secured with SSL technology. Arthroereisis: What Have We Learned? This issue of Foot and Ankle Clinics, guest edited by Dr. Normal Espinosa, will cover a number of important aspects of the Subtalar Joint in relation to foot and ankle surgery. 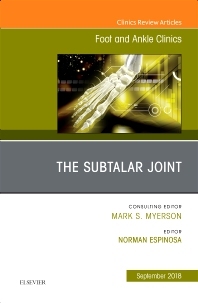 Topics discussed in this issue include, but are not limited to: Anatomy of the subtalar joint; Biomechanics of the subtalar joint (including normal and pathologic); Open technique for in-situ subtalar fusion; Traumatic injury to the subtalar joint; subtalar instability; and Fractures of the lateral process of talus, among others. We cannot process tax exempt orders online. If you wish to place a tax exempt order please contact us. Cookies are used by this site. To decline or learn more, visit our Cookies page. We are always looking for ways to improve customer experience on Elsevier.com. We would like to ask you for a moment of your time to fill in a short questionnaire, at the end of your visit. If you decide to participate, a new browser tab will open so you can complete the survey after you have completed your visit to this website. Thanks in advance for your time.